Is it just me that finds it to be a pain in the neck to load up your gear and drive to the nearest range for practice? Maybe it is just me because the closest driving range to me is about a half hour drive. Still, I have been wanting a practice net so I can practice conveniently in the comfort of my own home and I don’t think I am the only golfer who dreams of that. It took me a good amount of time to find the right net for my particular needs but I think I scored a hole in one (pun definitely intended) with the Spornia SPG-7 Practice Net. I don’t have as much free time to work on my game as I would like which is why this net has worked out so well for me and I am sure it will work just as well for any golfer looking to get the most from their practice time. So the first thing I noticed when I opened up the packaging for my Spornia SPG-7 Net was the amount of parts it came with. I was expecting an intricate production but the parts are minimal and the setup is quick. It is a lot like setting up a simple tent. It comes with a few support poles that you pop into the sleeves and the rest of the setup is just unfolding the net. Setting it up for the first time took me about 5 minutes and tearing it down took about 2 minutes so the entire process of getting it ready to go is very convenient. Now to the important stuff. This net functions really well. I can use almost any club on it and it securely catches all my swings. For instance I like using my pitching wedge at about 2 feet out form the net and it catches all my swings very nicely. The ball return system works every time too. I usually keep a few balls on my mat just in case but you can just bring one out and hit it over and over again without even bending over. It rolls the balls right to your feet and has a catching net at the bottom so they don’t go rolling all over the place. Another reason I think I made the right choice with this Spornia net is that I can use it indoors or outdoors. I usually like to practice in my backyard and it comes with grounding stakes that I can drive into the grass to secure the net firmly. When the weather doesn’t allow for outdoor practice, I can easily fit it (it stands about 7 feet tall and about 4 feet wide) in my garage. The Spornia SPG 7 Practice Net has lived up to all my expectations of it. It is a very sturdy net that can take the abuse of frequent practice and it makes it possible for me to work on my long or short game on my own property. So far I have been able to use it safely with all of my clubs. It would be nice if it could be used with a target sheet but I hear they are working on that. Even without the target sheet this practice net has been great for my game and saves a lot of time what with the quick setup and tear down. 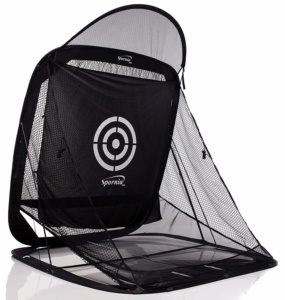 If you really want to get in some good practice without having to drive to the range then I strongly recommend the Spornia SPG-7 Golf Practice Net.